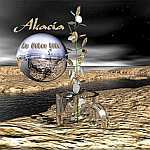 Review: "Akacia: An Other Life" - Sea of Tranquility - The Web Destination for Progressive Music! This Massachussets quartet (soon adding a full time keyboard player, if the rumors are correct) have been playing together since 2001. An Other Life is the band's debut disc. The heart and soul of the band (more on the soul later) is guitarist, keyboardist, vocalist, lyricist, producer Michael Tenenbaum. His nimble fretwork permeates the disc's four lengthy tracks from start to finish; accentuated with sparse, yet tasteful keyboard excursions. The disc opens with the title track. "An Other Life" is a 16:36 excursion into the realm of Akacia's harder edged sound, at times reminiscent of pre-2112 Rush. Vocalist Eric Taylor does have certain power and range problems, but his voice is not unpleasant and he does seem to come across stronger on subsequent tracks. The lyrics (and here's where we return to the soul) are heavily entrenched in Christian beliefs. I am not speaking of vague spiritual innuendos here, but full-fledged "Jesus is the Light" worshipping. This may be a deterrent to some, and I usually don't go for this type of preaching, but in judging the lyrics of so much popular music these days, this uplifting message goes over fairly well . The second track "Mary" is the shortest number on the disc. It has an almost R& B feel to it, similar to early American hard rock bands such as The Doobie Bros. More religious lyrics (I believe it's about The Virgin Mary or Mary Magdalene- no lyrics sheet included with the disc). Track number three "Hold Me" may be the most solid one on the disc. Mr Tenenbaum showcases a very bluesy and soulful side to his guitar playing. It begins rather softly with a David Gilmour type intro and slowly builds to a cresendo with a chop heavy solo, before shifting gears with the introduction of the keyboards and a very funky bass line. Interspersed with Jimi Hendrix-like psychedelia in the middle portion, this track really grooves. This brings us to the album closer, the epic "Journal" which clocks in at 22:41 . This may be the proggiest track on the disc. It opens with a very Chris Squire-like bass line , and some pleasant keyboards, before more Christian lyrics are introduced. Sub-divided into 7 sections, the track acts as a great vehicle for the band to show it's many sides. Although the track is very lyric-heavy in a Neo prog kind of way, there are still a few instrumental passages where Mr Tenebaum can display his fairly honed chops. Akacia may be a little rough around the edges but they show plenty of promise. The addition of a full time keyboard player ,and playing live whenever possible, can surely help this band round out and tighten it's sound. Perhaps a vocal coach for Mr Naylor would help him reach some of the higher notes and really bring the lyrical message across with more conviction. They've recently signed on with the great French label Musea to distribute An Other Life and that can only mean brighter days ahead for this band. On the heels of Glass Hammer, Neal Morse, Visual Cliff, and Saviour Machine comes the newest entry in Christian or Christian-oriented art/prog rock; is Akacia � an American band � Musea's first signing of such a band? I don't currently have the time to research that issue, but there is nothing vague, here: themes and lyrics do not get any more overt than this, so serious fans of the aforementioned bands will have something to look forward to. It's all here: epic-length tracks, sampled Mellotron strings, mondo synth sounds, rockin' Rush�ian wallops, Hackettsian arpeggiations, Livgren� and Gilmour�esque leads & solos. Vocalist Eric Naylor's � how about that? a name one letter removed from his Saviour Machine counterpart � masculine, slate-smooth voice alternately echoes Jeff Pollard (a little lower), Steve Walsh (a bit higher), and Ian Astbury (not as gruff). As stated, count on many a symphonic prog trademark � home-grown style � as the instrumentalists beef things up to ear candy levels. While still a longer song, "Hold Me" has the least amount of vocals by proportion � this allows for plenty of flexing by guitarmeister Michael Tenenbaum, and is the only song to prominently employ overdubbed guitar lines versus the live feel he usually goes for. Tenenbaum (who also recorded all of the album's keyboard parts), bassist Steve Sortz and drummer Doug Meadows trip through Floydian territory before a hybridized Kansas/Purple section opens up for Naylor. Sortz has the up-front tone to die for on this cut � dig it! Tenenbaum pulls off another smoker of a Blackmore solo�this guy can really wail. Album favorite for moi. "Journal" is the closer, a giant track with a ton of lyrics; sometimes it seems as tho it's a bit much, but plenty of instrumental breaks surge forth, including several fairly engaging faux-organ, piano, & synth solos. Certain vocal melodies & nuances from the title suite seem to reappear (not to great length), but everything is so expertly put together, so vigorous, so peppy, that you may not notice. Naylor certainly sings with enough conviction, and since his recorded vocals are not overloud, the end result is justifiable. Akacia's album is definitely worth a listen, and if you happen to feel you must focus on the music over the vox, you'll find much to occupy your ears. An Other Life is a fine debut by a fine, new American band.